WHY SHOULD YOU BECOME AN AFA MEMBER? Without joining, you are denied privileges of membership, cannot attend meetings, cannot utilize the member only Trip Trade Board, and cannot vote - including contract ratification votes. The cost is the same (it’s just called a service charge instead of dues). Be involved, be an active member, and have a voice in your future! If you are not yet a member, fill out an application and mail (must be original) to AFA International or submit to your LEC President. For your convenience, you will most likely want to complete a "Dues Check-Off Form" so that your dues are automatically deducted from your paycheck. Eliminate the hassle of paying another bill each month by completing this form. Additionally, Union members and their families can enjoy many privileges of membership, through programs such as UNION PLUS - brought to you by Union Privilege, established by the AFL-CIO to provide consumer benefits to members and retirees of participating labor unions. The AFA Membership Services Department processes all Membership Applications, maintains the membership database, oversees the dues delinquency process and administers all balloting procedures. 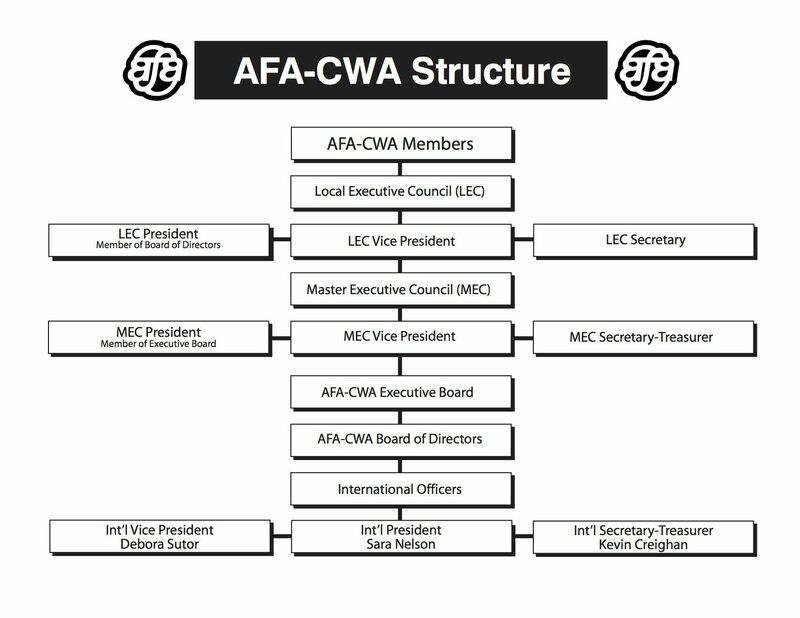 This department is located at the AFA-CWA International Office in Washington, DC. Section 21 of the AFA Endeavor contract outlines the requirements and process for payment of Union dues. Please refer to this section for rules specific to Endeavor. 1. Payroll Deduction – This is the easiest and best way to pay your dues. When using this method you must complete a Dues Check Off (DCO) form which authorizes Endeavor management to deduct the appropriate amount of dues from each paycheck. It is important to remember that AFA does not deduct the dues from your paycheck, this is management’s responsibility. Once management has made the deduction they are also then responsible for remitting the deducted dues, to AFA for processing. Note – Under the Endeavor contract, dues deducted this month apply to last month. Example: Dues deducted on March 1st and March 16th will cover the dues obligation from the prior month of February. 2. Monthly Payments – Members who wish to pay their dues monthly without payroll deduction, are mailed a coupon booklet to make their monthly payments. Each year in April, you will be mailed coupons, envelopes, stickers that correspond with each month and a DCO form. 3. Online Payment - For those members in a delinquent status or for those who choose to pay monthly/annually, payment can be made by credit or debit card online at www.afanet.org/payment. All member accounts remain in Good Standing until an invoice remains unpaid for over 90 days. After 90 days (or 3 billing periods) the account will be placed in Bad Standing and you will receive a Standing 2 letter advising you of your delinquency and subsequent Bad Standing. This letter requests payment in full by a specific date and requests that you contact the AFA Membership Services Department immediately. There could be an easy explanation or fix for the delinquency. One call to the AFA Membership Service Department could easily clear this up quickly. (See also FAQs below). If payment is not received by the specified date, a Standing 3 letter is mailed via certified mail, further advising you of the seriousness of your delinquency. The Standing 3 letter also advises that if the delinquency is not cleared within the contractually stipulated time period, AFA-CWA will invoke the Union Security clause of the contract (Section 21) and request termination for non-payment of the contractually required financial obligation to the Union. If payment is still not received during the contractual time limits following the Standing 3 letter you will be progressed to Standing 5. At that time, Endeavor management will be notified and termination will be requested for non-payment of Union dues/service charges. Should you have any other questions, contact Membership Services: Monday - Friday 8:00 - 17:00 EST. The phone number is 800–424–2401 and press #7 to speak to a representative. You can also contact a Local Executive Council Officer with questions. Their email addresses are here.